WELL, I KNOW what we are doing Friday night. 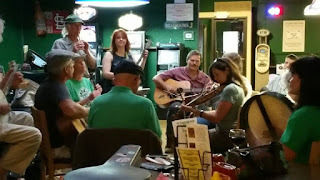 The Rag Tag Irish Band knows how to have fun! The Rag Tag Irish Band is playing at O'Griffs in downtown Quincy for St. Patrick's Day. If you live in Quincy or the surrounding area, you've seen them play. They are regulars on Wednesday nights at O'Griffs, located on the square in the 400 block of Hampshire. We hire them ever year for the MidSummer Arts Faire, now known as QFest. Obviously St. Patrick's Day is a big deal for them, and they have several gigs Friday, with O'Griffs being the big one. Several Rag Tag members have done business with us at Second String Music, and we are grateful. I love the band because they don't take themselves too seriously, but they are serious about having a good time. One of the members called me yesterday and asked how much I would charge to help them with sound Friday. I had to think about it for a second. "Do you pay in beer?" I asked. "Uh, what kind of dumb question is that?" was the reply. All we have to do is show up and tell them if they sound OK. I can already predict how this is going to go. "You guys sound great! Where's my glass?" I will say. So join us Friday night at 6 for St. Patrick's Day at O'Griffs with the Rag Tag Irish Band. Geesh. What could possibly be more Irish?